Is it a functional structure? 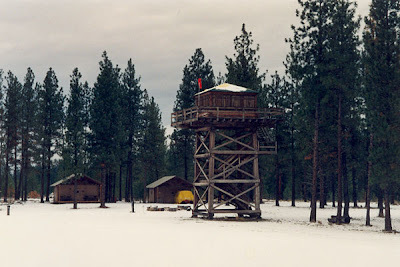 I know there are a number of similar dis-used places in ID/WA/MT that are rented as rustic accommodation for backpackers, cross country skiers, etc. Himself's former boss used to rent such spaces for his excursions. Nope, it was just a piece of quick-and-dirty construction for the movie, and I'm sure it would have never held up to that sort of use. If I remember right, when I saw it in the 90s it was already blocked off for alleged safety issues. And anyway, it was just a few miles from town, right by the airport and near other development, so it wouldn't have been a very exotic getaway. I've rented a couple of those Forest Service backcountry cabins before, and it's a wonderful experience ... pretty close to idyllic in lots of ways. Someday, I need to rent one of the lookouts! I didn't know that the lookouts could be rented! That would ease my worries about Ursus horribilus or whatever the grizzly bear's real, true Latin name is. I did like that movie. And it was terribly sappy. I've heard the football games at Libby are a real hoot too... haven't seen one myself (Class A), but apparently the pregame activities has much to do with chainsaws! Quite a ruckus I'm told.